This holiday season as you stress over what to wear to the countless number of parties you have to attend, you won’t have to stress about your hair. Why? Because below you will find two easy-to-do glamorous hairstyles with step by step instructions from celebrity hairstylists so that you can easily reproduce a head-turning polished look to stand out at your next event. Celebrity Hair Stylist, Julius Michael, shares his tips, techniques, and a step-by-step tutorial on how to recreate the stunning retro glam look see above. 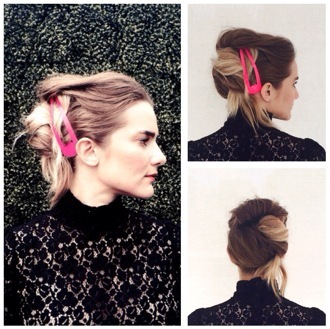 Jenny Balding, Cutler/Redken Stylist, shares her favorite style to take you from work to play. It looks a little complicated, but don’t worry, it only takes 10 minutes to achieve this look. • Start with day old hair as you’ll have some texture in your hair and it will be easier to manage. • Use dry shampoo to really boost the texture of your roots (Redken Pillow Proof dry shampoo is excellent). Spray throughout your roots and even the mid-lengths to create body and texture. • Shake through with your fingers. • Use a light hairspray for a little hold – Redken Fashion Work 12 Versatile Hairspray works best as it is a versatile spray. Mist over all and shake up with your hands to really create body and movement. • Section out the crown and front area and pin to one side. • Sweep the sides and back together and then twist upwards and pin. Make sure to use hairpins (U shaped pins) so they can really anchor the hair. • Take your top section and roll under and pin at the crown for a little height in this area. Loosen the hairline a little with your fingers to work suits your face shape best then add a hair accessory of your choice. • To finish, add a little shine by misting Redken Diamond Oil High Shine Airy Mist all over – this is very light but gives just the right amount shine you need. Next Next post: When does your makeup really expire?